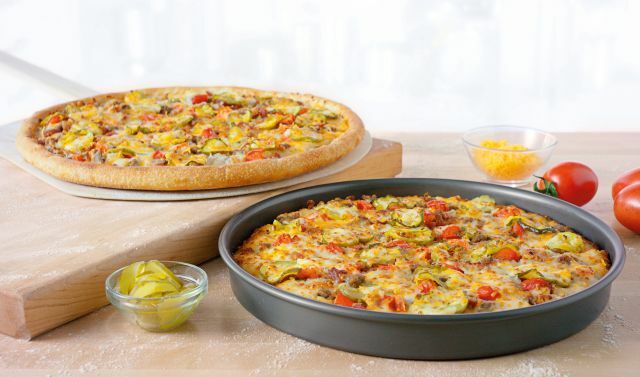 Papa John's readies for the summer by bringing back the cheeseburger pizza. This time around they've added bacon and cheddar to the mix and are calling it the new, limited-time Bacon Cheddarburger Pizza. The pizza comes topped with beef, hickory-smoked bacon, dill pickle slices, fresh Roma tomatoes, Wisconsin Cheddar, cheese made from mozzarella, and burger sauce. It's essentially the previous Bacon Cheeseburger Pizza with the addition of cheddar cheese. While it's around, you can get a large hand-tossed or pan Bacon Cheddarburger Pizza for $10. The chain also introduces new Bacon Cheddarsticks for $6. The new side features pizza dough topped with Special Garlic sauce, hickory-smoked bacon, Wisconsin Cheddar, and cheese made from mozzarella. Pizza sauce is included for dipping. You can find both items for a limited time through June 25, 2017.